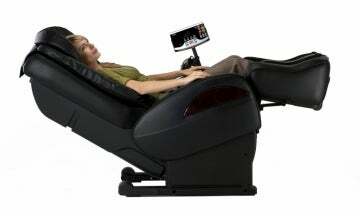 Sanyo showed off this "zero gravity" massage chair at CES, and it isn't your pappy's Brookstone massage chair. It's got "intelligent Stiffness Detection Sensor technology," figuring out where your body needs some TLC by checking changes in your pulse rate and where you're sweating the most. They claim it's very similar to galvanic skin response technology used in lie detectors. If you're so stressed out that you require this much fancy technology to massage you after a long day at work, might I suggest a career change?